There’s a sense of interior mystery in Magdalena, the full-length debut of María Grand. The 26-year-old Swiss native uses her tenor saxophone like a truth-illuminating candle, her haunting lines exploring every crevice of her equally somber and arresting compositions. No matter how rapt the improvisations, an itch of unknowing pervades the search. A regular in Steve Coleman’s groups, Grand makes music that’s similarly adventurous. Magdalena expresses her thoughts on the work of family therapist Virginia Satir, creating music rife with female symbolism. It unfolds like a dream: “Stories of ancient times,” says the enchanting Jasmine Wilson in “La Immortal,” as piano twinkles below and Grand circles above. Drummer Jeremy Dutton snaps every song awake, pianists Fabian Almazan and David Bryant frame the stage, and guitarist Mary Halvorson adds angular counterpoint in a couple of songs. This music can be unsettling, as in “Imani/Walk By,” its ethereal spoken word creating odd appositions with sweeping piano lines. The album’s saxophone/bass/drums centerpiece, “TI:Isis/TII: Maria/TIII: Magdalena,” begins with sizzling rhythms over which Grand darts and soars. Her lovely, calm-inducing tenor opens “Maria”—which cavorts like a happy sleepwalker, building in intensity with starts and fits—and slides into the title track like a ghost, cymbals swelling and subterranean bass notes dancing as she creates rustling waves of sound. Grand’s open-ended, abrupt, lingering music ever revolves, never resolving; it asks questions and forges ahead. Magdalena satisfies, but leaves you wanting more. 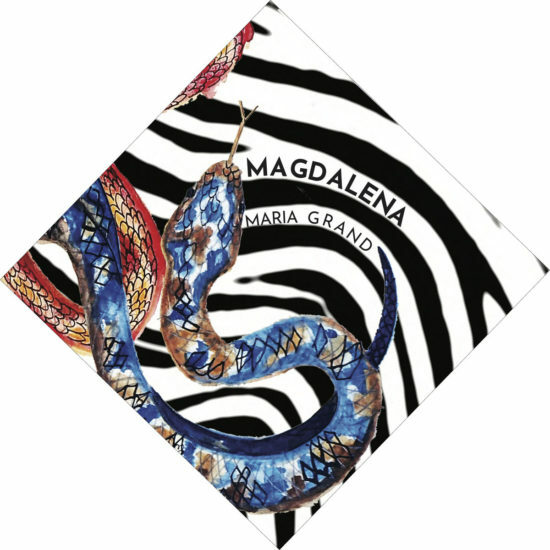 Preview or download Magdalena on Amazon!